Conrad and Alec haved avoided being at odds with one another since Alec appeared on the scene. For the most part, Conrad has played it cool and is nonplussed about the handsome clinic doctor who is growing closer to Nic. 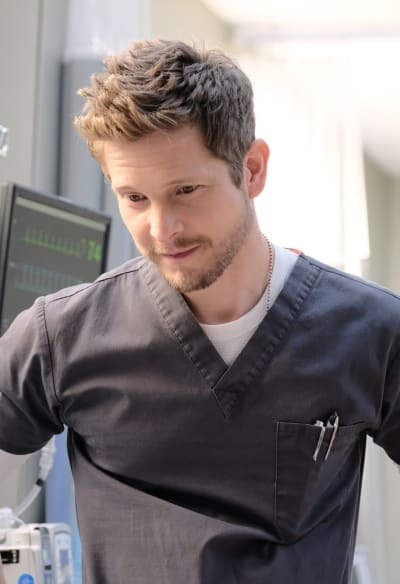 On The Resident Season 2 Episode 18, everything may change when our resident rebel butts heads with the street doc who doesn't play well with others. Conrad and Alec will work a case together, which is nothing new for them. They have done it before. However, on this case Alec crosses a line of which Conrad can't accept. Alec lies to a patient about something he shouldn't and while Alec chalks it up to them having a difference in methodologies and tactics, Conrad is peturbed by the ordeal. The friction between the two men may also be over Nic. Despite knowing Nic was seeing Conrad, Alec made a move on Nic anyway. It hasn't affected the two of them working together in the clinic,but it would cause some issues for Conrad. Does Nic know about the tension between the two men? How does she factor into this? Of course, Nic will have her hands full during this installment. Not only is Jessie back, but the two women are also visited by their father. Elsewhere, Julian is alive and well! Yes, she's back! Ater Gordon was defeated and QuoVadis, too, Julian has risen from the ashes and made an appearance. Conrad can be heard asking Devon if he know about Julian, and a shocked Devon tells Conrad he thought Julian was dead. Julian has quite a tale to tell, and I'm all ears! Check out the promo below and hit the comments.